Andrew Henry says: Yes this man is driving an ice chest. 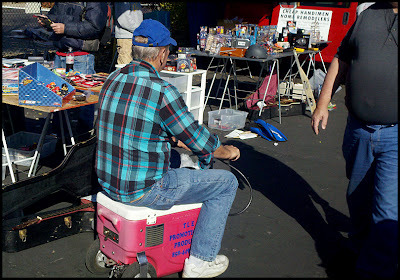 These are the kinds of things I see when I follow Jeanette around the flea market. Makes for a most interesting day to say the least. Jeanette says: I wonder if anyone took a photo of me in my sweats and rather unkempt hair? Great to see the world though someone else's lens - didn't know driveable ice chests existed.....has it given A-H ideas to convert your snappy new number to a motrorised version? People make the oddest contraptions. Jeanette you made me smile this morning!! There are more Holiday Giveaways to come and several still open! Stranger than fiction! Happy Monday, everyone. Maybe this is this man's version of the "husband Chairs" that you see in the ladies' section of department stores - a place for them to sit while they wait, and wait...only at the flea market, his lady is on the move....so he is too LOL! Either way - all good fun! Only in America! This is too funny; great pic! love that you two do this!!! that is so cool and funky... never seen anything like it! Haha...almost as unbelievable as those Walmart pics.